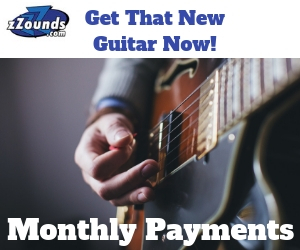 The first wah pedal was introduced in 1966 and since then the design has not changed much: a bunch of moving parts and potentiometer that eventually wears out over time. In the 90s the wah got its first upgrade in design with switchless optical sensors but still remained fundamentally the same. Well now after over half a century of same ol’, same ol’, EHX has changed the game completely with the Crying Tone: the first wah pedal with absolutely no moving parts. Technology is a wonderful thing! And the same technology that allows your smartphone to automatically switch over from portrait to landscape view is what allows for the Crying Tone’s innovative design. From the top it looks like a normal wah pedal but flip it over and you’ll notice the pedal mechanism is totally different. The bottom of the Crying Tone is beveled to allow the user to rock it back and forth with their foot. Movement is sensed by an accelerometer inside, which controls the frequency sweep. Since there are no moving parts, it’s built like a brick. Constructed as one solid piece with some pretty hefty mass to it, the Crying Tone won’t fly all over the floor when you use it. On either side of the pedal you’ll find the calibration button (for when the Crying Tone is not on a flat surface), a 9V DC input (also takes a 9V battery) and the in and out jacks, which are strategically placed at the fulcrum point so not to interfere with operation. Finally, on the top of the Crying Tone is the EHX logo which lights up and blinks red so you actually know when the pedal is on! That’s really all there is to it – innovation in simplicity. Using the Crying Tone is as simple as its design. Calibration, while unique for a wah pedal, is a breeze. Just push the calibration button, wait for the EHX Crying Tone logo to light up and start flashing, rock the pedal all the way back and press the calibration button again. Voila! You’re calibrated. Turning the Crying Tone on and off is easy too. Unlike some traditional wahs where you sometimes feel like you have to place the entire weight of your body on to the pedal to turn it on, the Crying Tone activates and bypasses by simply rocking it forward toward the floor. The action of the pedal is very natural too. Rocking you’re foot back and forth is extremely smooth with no moving parts involved and the range of motion of the pedal feels a bit larger than that of a tradition wah pedal. 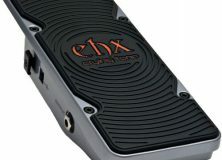 The big difference anyone should notice about the Crying Tone compared to other wah pedals is that it tracks the movement of your foot extremely well. This allows you to create some really short and rapid frequency sweeps with little effort, but may also take some getting used to. 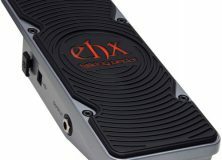 Producing the sound of a wah pedal without using all the traditional hardware was probably no easy feat but EHX really delivered with the Crying Tone. I compared it at home with my Jimi Hendrix edition Cry Baby and really, I could barely tell the difference. The Crying Tone is clean and fluid with plenty of thwack and snarl. Don’t get me wrong, this is a great pedal and I have nothing but high praises for the design, usability and sound. But at the risk of being knit-picky, I do want to mention one slight drawback. Obviously, due to how this pedal operates it can’t be mounted to a pedal board. There’s no way around it. I suppose genius innovation is not totally without its trade offs. So if you want the Crying Tone on your nicely organized and well secured effects board, you may just have to deal with it flopping around when you transport it. On the other hand, maybe someone will come up with a good idea on how to make it work. The real question is, is this a deal breaker? I would say no. The Crying Tone beats its competitors on ease of use, functionality and, in theory, longevity (since there are no moving parts involved) without skimping on quality or features. At a very affordable list price of $116, the Crying Tone is definitely going to make its home on many pedal boards and find it’s way into many recording sessions. Not the only drawback, just not being able to have them on you pedalboard. It is definitely not nitpicking. It is crucial. Also, a lot of loose cables, even your guitar cable are even more prone to accidentally get underneath the pedal than with regular ones. You should’ve mentioned that a lot of players wants to take their foot off from the pedal and leave it in “half-cocked wah” position, and make the pedal stay there. 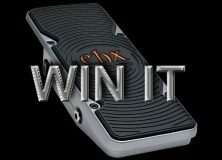 It seems that EHX will release Volume and Expression pedals too in this series. If one can’t leave them at a middle position and take off the foot from them, especially volume pedals, I really find these pedals quite … hmm…worthless. To me. And most people, actually. Sorry, but someone has to be the Caveat Emptor. Can we have a pedal-like housing for our FX-boards? Pleeaase? Seriously: An EH-Wah – how sooperkewl is that? But w/out being able to mount it on my board – deal-breaker. Indeed. BIG 1.